Roberts TechWorld: Connections 5 - External Users - I walked straight into the trap! Connections 5 - External Users - I walked straight into the trap! After enabling External Users in Connections 5, I started getting TDI (Yes, I still call it TDI, even though the new name is SDI) sync errors on existing profiles. 14:06:06,665 ERROR - !com.ibm.lconn.profiles.api.tdi.service.TDIException: CLFRN1254E: An error occurred while performing findEntry: USERNAME.! 14:06:06,665 INFO - CTGDIS274I Skipping entry from [addorUpdateDB], CTGDIS393I Throwing this exception to tell the AssemblyLine to skip the current Entry. If used in an EventHandler, this exception tells the EventHandler to skip the remaining actions..
And after enabling all kinds of TDI debugging, still no luck in expanding the error message into a more understandable one. Which immediatly after being run gave the error message. But what´s not good is that the field "mode" is set to empty brackets... Which actually means that tdi interprets this as "null". So I reached out to my good friend, Eddie Hartman, and he helped me debug even more. 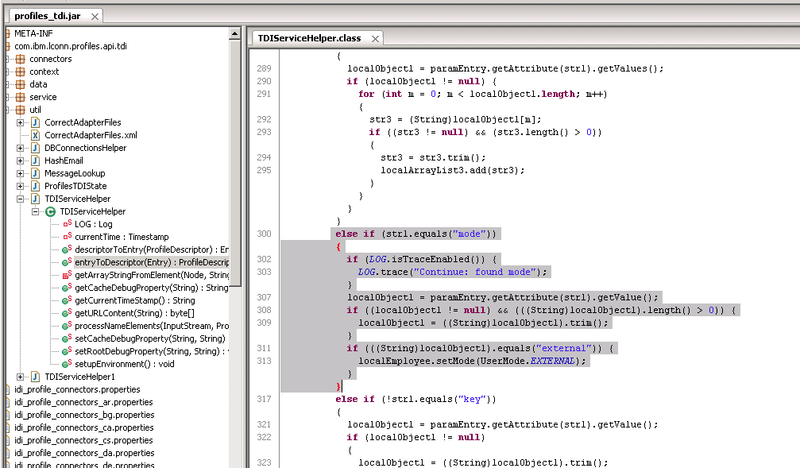 We opened up a Java Decompiler, opened up the profiles_tdi.jar file and found the correct class. Here it checks the length of the field "mode"... No "null" checking to see if the object actually exists. So the reason for my sync errors was a trap that I walked straight into!! In CNX5 there´s a new option to create external users and bring them into communities where you can collaborate with them. This is defined in the "map_dbrepos_from_source.properties” file. and then created a tdi job which set this field on the external users in the domino ldap. Value of the memberType field is just a text string I set to "external". # In all cases, the value of the LDAP attribute/js-function must be one of two strings. # than “external" is interpreted as employee. And the domino usersdocuments does not have this as a field originally!! That´s why we saw this as “null”. So, problem was solved as soon as I created this field in the domino userdocument, all of the documents. Thanks to Martin, Sjaak, Rainer, Lars, Keith and Klaus for participating in the debug-discussion! And of course: Eddie Hartman for President!! So, it does not have to be a direct LDAP attribute which contains the value "external". It could be also the mail address which includes the term ".external". Or a specific LDAP tree and you evaluate $DN property.